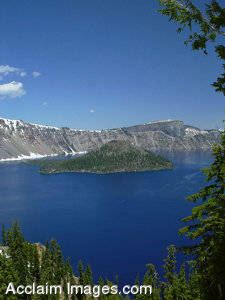 Description: Stock Photo of Crater Lake and Wizard Island. You can still see the snow surrounding the rim of Crater Lake. There is no snow only a few months out of the year at Crater Lake in Oregon. You may purchased this photo as a poster or an art print. You may also license it as stock photography.